Hamster owners and animal behaviour researchers agree on one thing: hamsters love their wheels! They can even clock up several miles a night which is equivalent to several marathons. Buying a hamster wheel for your little pet is not easy as it may first seem. There are decisions about what material, design and size you should choose. You also need to know the risks of hamster wheels and how to spot when things are going wrong. For some down-to-earth practical advice on the best hamster wheels and the answers to your wheel-related questions, read on. 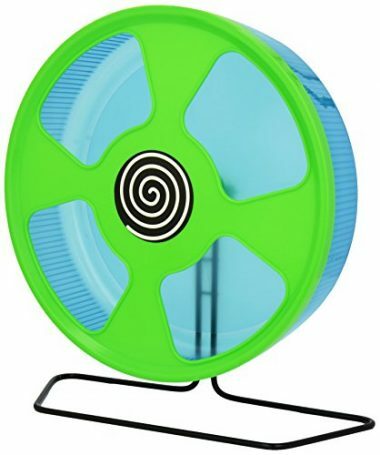 An ideal hamster wheel for all hamsters as well as gerbils and mice. It includes a cage attachment for mounting and solid back wall to increase confidence. It is called a ‘Silent Runner’ because it has no centre axle and instead glides on a ball-bearing mechanism. This makes it both smooth and silent. The wheel has been designed with safety as a priority. There are no pinch areas and no axle to cause spinal injuries or to trap fur. The running track is textured to improve grip and the bean-shaped openings contain your hamster safely. 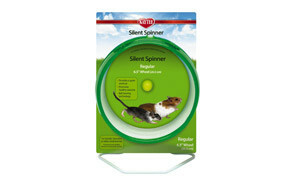 Silent Spinners hamster wheels will work as either a free standing unit or will attach directly to a wire cage. They are manufactured from high quality plastic which is both safe and durable for your furry little friend. The spinner hub is enclosed to cut down on noise. There is a mini (4.5 inch) version which is just right for smaller hamster breeds and other small animals. The regular (6.5 inch) version is perfect for larger hamsters and the giant (12 inch) version would suit rats and chinchillas. 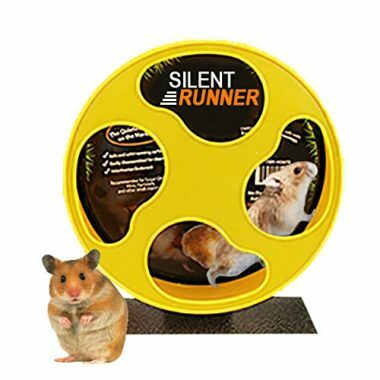 A hamster wheel that promotes exercise and therefore health for your little pet. 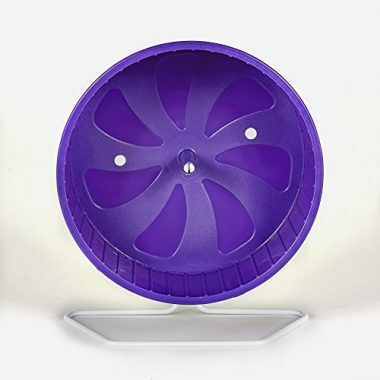 The spinning mechanism is completely quiet and the wheel is robust and easy to clean. The solid running surface is enjoyable for hamsters and is completely safe for your peace of mind. There will be no trapped toes or tails! It’s available as a handy two pack and the medium size is perfect for smaller hamsters. 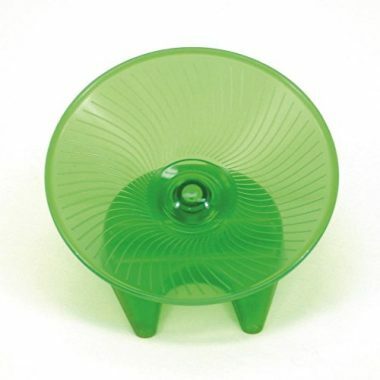 This attractive hamster wheel is made from premium grade PP material which is non toxic to your little pet. It’s also durable and won’t break or crack during use or cleaning. You won’t have any problems putting it together or taking it apart when you want to clean it. It has a 3-point seamless button design which makes it more stable and therefore safe. When your pet is having great fun and healthy exercise, you get peace and quiet because it has a quiet spinning mechanism. It’s available in a five inch, seven inch or eight inch version so you can pick the one that suits your hamster best. The 12 inch version of the ‘Silent Runner’ is spot on for larger hamsters. The four inch wide track is ideal for larger pets. There are no nasty pinch hazards and the textured running surface is non-slip to prevent injuries. The front face is not wide open so your hamster can’t come flying out of the wheel and injure themselves. The solid back wall is a feature that hamsters love as it makes them feel more secure when using the wheel. This silent hamster wheel will give you a peaceful home. 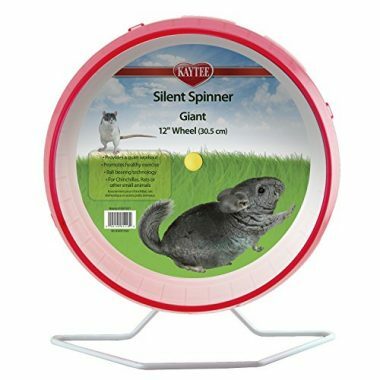 This is a larger, free-standing wheel which is suitable for larger hamsters, rats and chinchillas. It can also be fixed to the cage if desired. The wheel mechanism utilises a patented ball bearing technology on a plastic spoke which is very quiet. There is no wire spacing so little feet cannot get caught and this eliminates nasty injuries. Inside the wheel there is a high quality, two-toned plastic running surface which is very comfortable to run on and it has raised treads for improved grip. 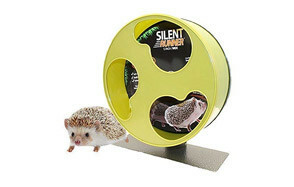 This is a super cute, novelty hamster wheel that will make you smile every time your little friend uses it! The wheel is perched on top of a car-shaped stand with functioning wheels and a drive mechanism connected to the wheel. It is completely enclosed and secure so it’s an ideal place to put your hamster when you are cleaning out their cage. You can use the Critter Cruiser in several different ways. In the top position, it acts just like a regular wheel and the cruiser simply acts as a stand. In the middle position, as your little critter powers around the wheel, it rolls the Critter Cruiser forward on a flat surface. 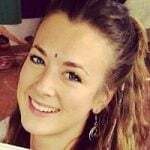 This product is also compatible with the Kaytee's Hamtrac. 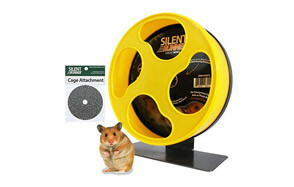 The Trixie wheel can be free-standing or fixed to your hamster cage. Its main feature is that it is especially gentle on the spine because of its optimal size and the smooth way in which it moves. Instead of rungs, the wheel has a solid running surface with lateral reinforcements to give the safest exercise workout. The sealed back prevents entrapment of toes or tails and cuts down the risk of nasty injuries. The larger size prevents your pet from getting a hunched back. 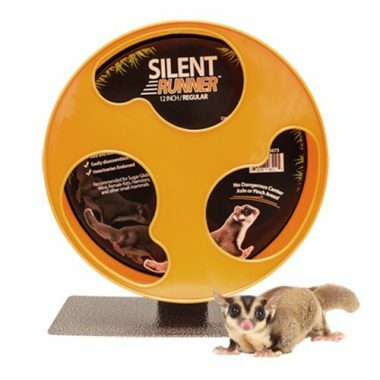 This product is a larger version of the Silent Runner but has a slender 3.5" wide track for hamsters. As with the other Silent Runner wheels, the mechanism is very quiet and smooth. There are no sharp edges or joints to trap fur or little toes and bean-shaped openings for maximum safety. The Kaytee Comfort Wheel has a very safe and solid running surface for maximum comfort for your furry friend when they are exercising. It has a quiet operation and the construction has been designed to make sure that tails do not get trapped. It’s easy for hamsters to get into, which encourages use. It can be used with its own heavy-duty wire stand and a has a two-way attachment clip so it can also be fixed to a wire cage. When you are thinking of buying some for your pooch, here’s what you should bear in mind. 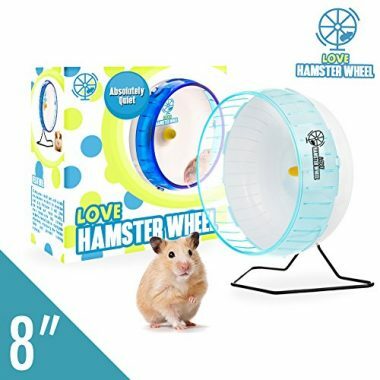 It is recommended that you choose a wheel of 6.5 inches for dwarf and Roborovski hamsters and at least 8 inches for larger Syrian and other larger hamsters. It’s really important that you don’t give your hamster a wheel that is too small for them. The larger a wheel is, the less the hamster has to arch its back and the more similar it is to running on flat ground in the wild. It is usually best to choose a wheel with a solid running surface. Meat rungs can easily trap a hamster’s tiny feet. This can lead to a nasty foot infection called ‘bumblefoot’. A solid metal wheel is a possible option and it may last longer than plastic. Some wheels have a solid back wall and the idea of this is to make your hamster feel more confident about using the wheel. In the past, hamster wheels were completely open at the front for ease of access but now wheels are available which are partially closed off at the front. The theory is that these cut down on injuries as hamsters cannot be flung out of the wheel when using it at speed. Supporting sidebars across the diameter are not recommended because they can cause injury if your hamster sticks its head. 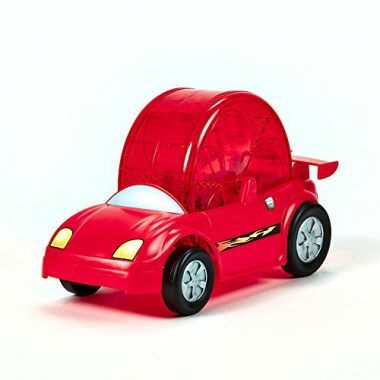 There are novelty wheels such as those on toy vehicles that your hamster can propel around the room. These are comical and great fun but are only suitable for short periods. If you don’t want to be disturbed at night, you need a silent hamster wheel! Many wheels are supplied with attachment mechanisms so that they can be fixed into the cage. This adds stability and may cut down on the amount of room they take up. The wheel may also be supplied with a two way attachment and a stand so you could use it outside the cage. If you have more than one hamster, the advice is that you need more than one wheel. Of course, the size of your cage may limit how many wheels you can safely fit in. When they live in the wild, hamsters are very active creatures. They spend most of their waking time scurrying around to gather food or dig burrows and cover many miles. When they are housed in a cage, this biological programming is not turned off! They still have an in-built need to be active and run around but hamster cages don’t give them anywhere near enough room to do so. This is why a hamster wheel is so beneficial. A hamster wheel enables your little furry friend to run for miles without ever leaving their cage. There are several accounts (including one from the American Society for the Prevention of Cruelty to Animals) of hamsters running five or six miles a night on a wheel. There are clear benefits for your hamster’s physical and mental health. A hamster wheel is essential for weight maintenance. Without enough exercise, your hamster could become obese. This puts a strain on their heart, lungs and other organs and could shorten their life expectancy. However, there is another serious condition that can arise if your hamsters don’t get enough exercise. It is called ‘cage paralysis’ and is caused by a lack of exercise. If your hamster is also obese, it adds to the problem. The inactivity leads to muscle and bone degeneration and eventually your hamster will lose the use of their hind legs. In severe cases, they can become completely paralysed. If caught early, cage paralysis can be treated with a combination of daily exercise on a hamster wheel and vitamin supplements but you must consult a vet. A happy hamster is a busy hamster. As naturally inquisitive little creatures they require mentally stimulating toys and a wheel fits the bill nicely. Without one, self-destructive behaviour such as chewing their own hair or skin, gnawing on cage bars and breaking teeth can set in. Varieties such as Syrian hamsters, who are often housed alone, have a particular need for a wheel to stop them getting stressed and restless. Hamsters love hamster wheels! Studies have shown that rodents living in the wild will hop on one and give it a go even though they have limitless space in which to run. Hamster wheels can be made of metal or plastic. Metal wheels last longer but have rungs on the running surface which can cause injuries and sores. You can make them safer by running strips of thin cardboard or paper in and out of the rungs. Plastic wheels are usually constructed from one solid piece of plastic which is safer. Many have a solid back wall and a partially enclosed front wall. A flying saucer hamster wheel looks more like a dish. You can get cage-mounted and stand-alone units in a variety of sizes. 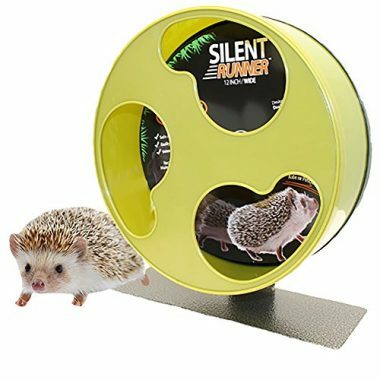 It is very important to get one that is big enough for your pet and a quiet hamster wheel will save your sanity. Q: Are hamsters wheels safe to use? A: Hamster wheels are essential for the health and well-being of your little pet but that does not mean that they can’t cause injuries. You can, however, do a lot to reduce the risk of injuries occurring. Running with an arched back is never good for your hamster and is not something they do in the wild. If your hamster arches their back when running, you need a bigger wheel as a matter of urgency. It may be amusing for some people to see a hamster getting flung out of its wheel but it is actually no laughing matter and can cause injuries. You can limit the risk by buying a large hamster wheel with a solid back and only small openings at the front. Hamster legs can get stuck in the rungs of metal wheels and this can cause fractures. Fur and tails can be trapped too. A solid plastic wheel with no sharp edges and crevices may be the safest option. Finally, there is such a thing as ‘wheel addiction’ where excessive use of a wheel causes feet sores and blisters. You can help this by buying a plastic wheel and providing other toys as a distraction. If you are feeding your hamster too many sunflower seeds, they can become hyperactive and this can lead to excessive wheel use. Q: How often should my hamster use a wheel? A: This is very much up to your hamster. The important thing is to make sure that they have access to it whenever they want to have a run. If you have more than one hamster this may mean that you need more than one wheel. Hamster wheels usually get used most at night. If you have an enclosed hamster wheel outside the cage, you should only use this for short periods and only once a day. Q: My hamster rarely uses its wheel, what should I do? A: The majority of hamsters absolutely love their wheels and so if your hamster is not using theirs it could indicate that something is wrong and deserves some investigations. The most likely explanation is that he or she is using the wheel when you are not around. Hamsters love to use their wheel at night so it may be worth you staying up a bit later one evening to spy on them. If the situation doesn’t resolve in a few days, or if there are other symptoms, you should discuss the issue with your vet. The other explanation is that there is something wrong with the wheel. This is more likely if it is your first hamster (and hence your first wheel) or a new wheel that you have introduced. There has been some research to indicate that hamsters have very clear opinions when it comes to wheels! The study showed that Syrian hamsters preferred larger wheels (35 cm versus 23 cm diameter), completely circular wheels and those that provide good footing on the running surface. Male hamsters were fussier than females! Swapping a small wire wheel for a large plastic Syrian hamster wheel may just do the trick. Q: Are hamster wheels noisy? A: Yes, some of them are. A few poor owners are actually kept awake at night by the noise which can be relentless as your furry friend sets off on their nocturnal marathon. Many integral wheels that come with cages are very noisy. There are a few things that you can try. As a temporary measure you can remove the wheel but they are essential for your pet’s health so this is not a permanent solution. You could try changing the position of the wheel because it may be rubbing against something as it turns. You can try lubricating the rotating mechanism with some olive oil to reduce squeaks. There is also the option of moving the cage to another room. For many owners, the only solution is to invest in a quiet hamster wheel or a silent spinner hamster wheel. Q: How fast do hamster wheels turn? A: The wheel has no power of its own and it entirely propelled by your pet so they are in control. The wheel will turn at the speed that your hamster is running. Some ingenious hamster owners have rigged up speedometers to their hamster wheels and speeds of 2.5 mph are maintained quite easily. Sometimes they travel so fast that they look like a blur. YouTube has plenty of amusing footage of hamsters flying around their wheels and being flung out of them. However, as a note of caution, this could result in nasty injuries and may indicate that you need a bigger wheel. 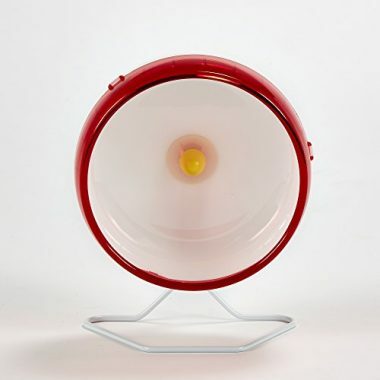 A hamster in a wheel can generate up to 500 mW electric power which is enough to illuminate a small LED lamp! Q: How to clean hamster wheels? A: Hamster wheels need to be cleaned to remove the bits of bedding, food and poo that cumulate on them. A clean wheel is safer and more attractive for your pet so carry out a thorough clean as soon as it appears dirty. Start by taking it out of the cage and shaking or dusting off the loose debris. Then place it into a bowl or bucket of hot water and allow it to soak for a while. If you need to avoid water getting into the ‘spindle housing’ of the wheel it is best to run it under a hot tap instead. Stubborn stains and greasy marks can be rubbed off with a sponge or old toothbrush. Only use a detergent that is approved for use in hamster cages. If you are unsure, check with your vet. Thoroughly rinse and dry it very thoroughly to make sure that it is not slippery. Check that it spins okay before popping it back into to the cage!